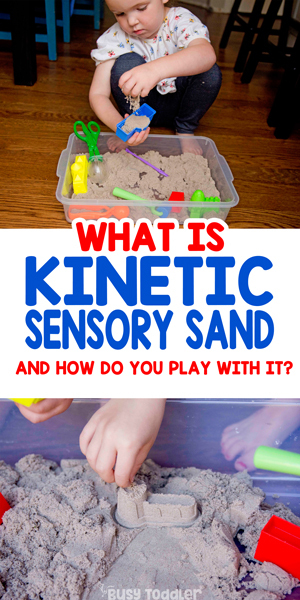 Kinetic Sensory Sand - What is it and how do you play with it? 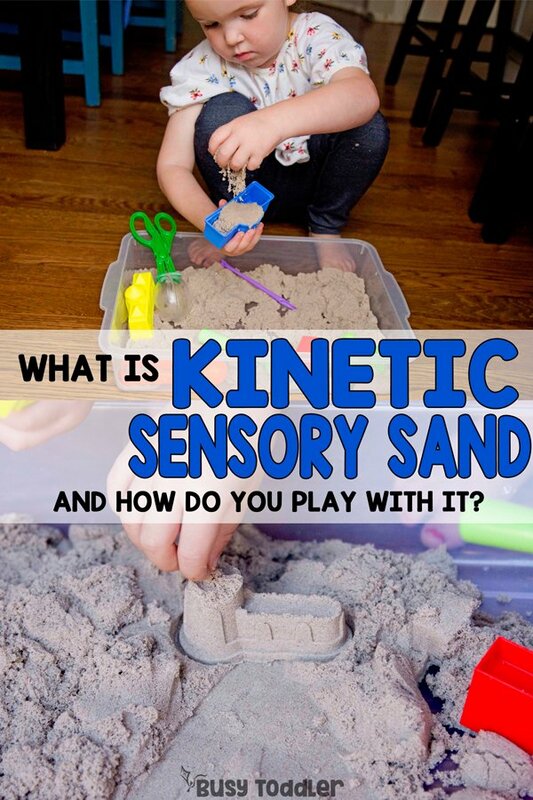 What is Kinetic Sensory Sand? You’ve got to jump on this bandwagon. I am all about jumping on a good bandwagon, and I’m telling you: kinetic sensory sand is the one you need to jump on. 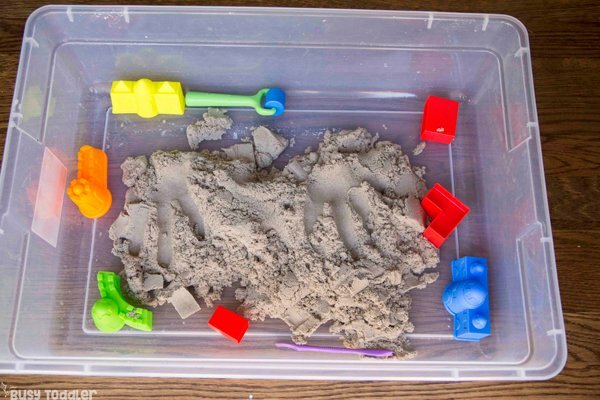 Kinetic sensory sand is, well, pretty amazing and it makes for one insanely quick and easy kids activity. Obviously, I’ve got you covered. 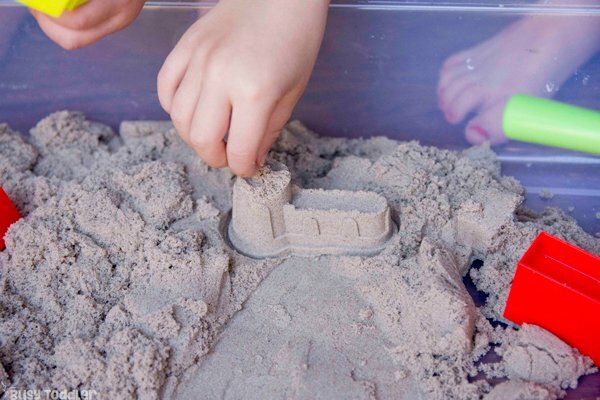 Playing with kinetic sensory sand is so easy! 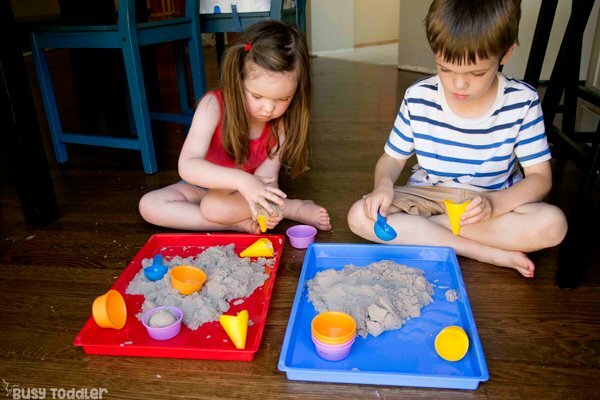 Kinetic sensory sand is fun to play with just on its own. I love (yes, I said I, as in me – a 35-year-old mom of 3) running my hands through it. You never get over how cool it feels. It moves and molds, bends and cuts in a way that is completely different from other sensory bases. It has a velvety smooth texture – it isn’t gritty like sand. This isn’t going to get in your toddler’s eye like traditional sand will. But what else can you do with kinetic sensory sand other than just run your hands through it?! 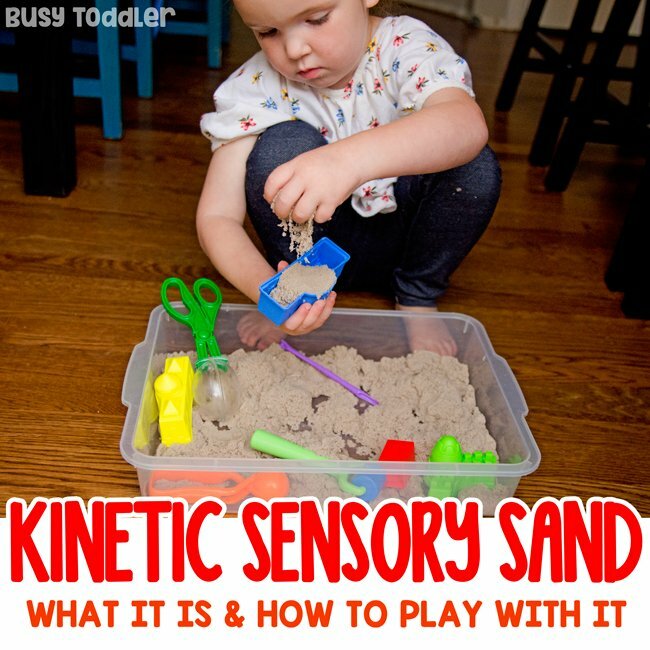 There are so many great ways to play with kinetic sensory sand! 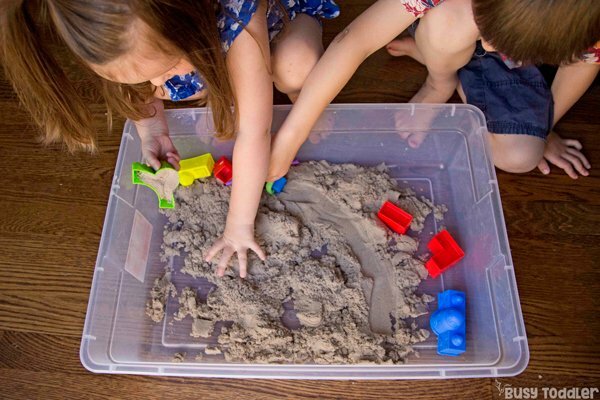 This is an EASY way to introduce kinetic sensory sand to your family – it’s actually exactly how this obsession started at our house. My kids got this set from Grandma after we saw it in a Lakeshore Learning store. We love wandering Lakeshore stores to see their amazing toys and the kinetic sensory sand jumped out at us that day. No surprise – it was amazing and took our family by storm! We were all in love with this set. Now I’m on a mission to let everyone know how amazing Lakeshore’s kinetic sensory sand is! 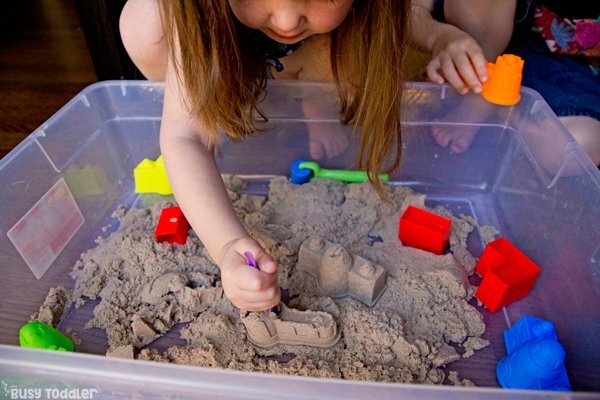 The Mold & Play Sensory Sand Set comes with a little bit of everything to start you on your kinetic sensory sand adventure. I’m a huge fan of the building molds – there’s nothing more satisfying than pretending you’ve made the world’s most intricate tiny sand castle. There are also great little blocks that make perfect cubes. 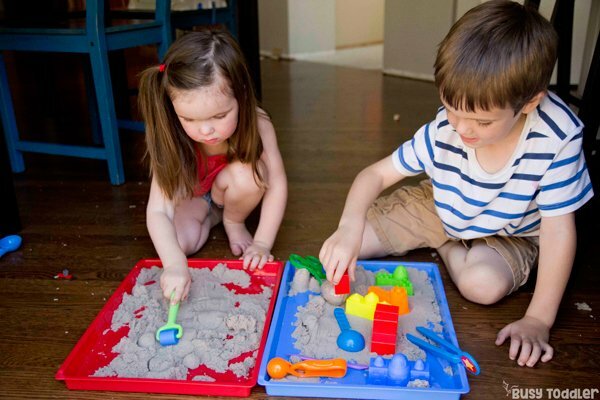 My kids love the roller – making the sand smooth is a big deal. They love making “parking lots” and “lawns” in their sensory sand. Between the building, rolling, and scraping, my whole family plays with this set for hours. It never gets old (literally and figuratively: one of my favorite parts of kinetic sand is that it doesn’t get old / go bad.). 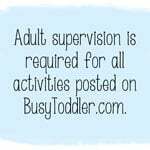 What’s better than just sensory play? Sensory play and imaginative play combined. My kids (3 and 5) think they run their own Dairy Queen with this Sensory Sand Ice Cream Set. 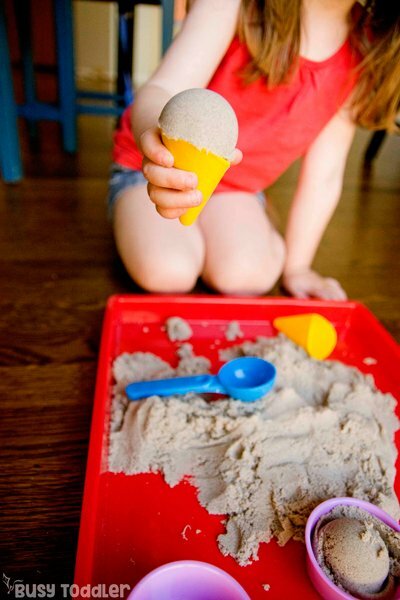 The kinetic sensory sand works perfectly to make little ice cream scoops; it even has tiny cones and bowls for them to serve their creations in. But even when they’ve finished playing ice cream shop, they have loads of open ended opportunities with the set. The spoons are perfect for scooping, there’s an endless number of cones to build, and the cups are great building molds too so this isn’t a one-and-done type toy. The play possibilities are endless. Technically, these aren’t specifically made for sensory sand but trust me, these are the best. 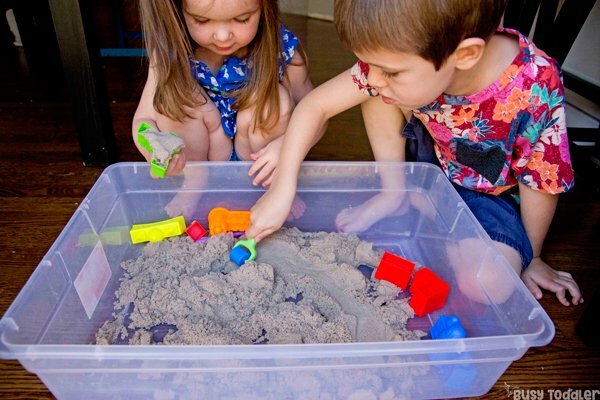 My kids have so much fun working with these tools in their kinetic sensory sand bins. 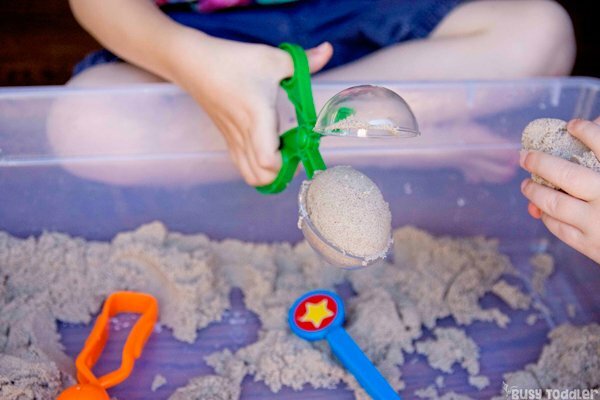 The squeeze and scoop tool is perfect for making sand balls. There is also a wavy water dropper that comes with this set which is so much fun for liquid activities. 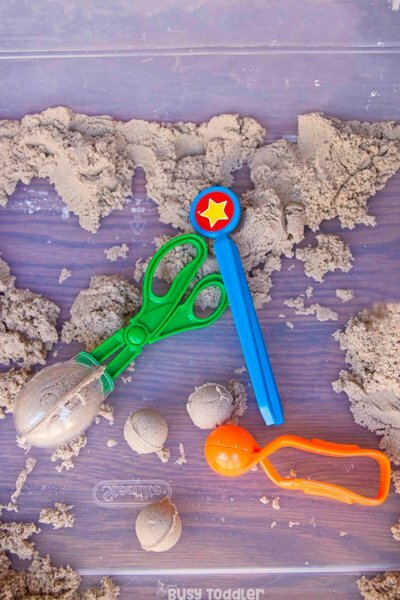 These tools come in handy all the time for my family, and especially with sensory sand. They just work so perfectly together. 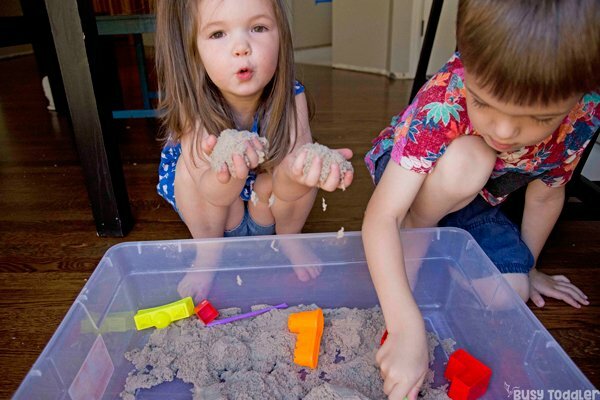 Trust me – kinetic sensory sand is amazing. It’s also amazing what an easy, low key sensory activity it is for kids. Just grab your bag of sand, dump it out, add a few toys and viola. You’ve got happy playing kids, totally engaging with their sensory sand. I got my kinetic sand from Lakeshore. I’m a huge Lakeshore fan – and have been for more than a decade. 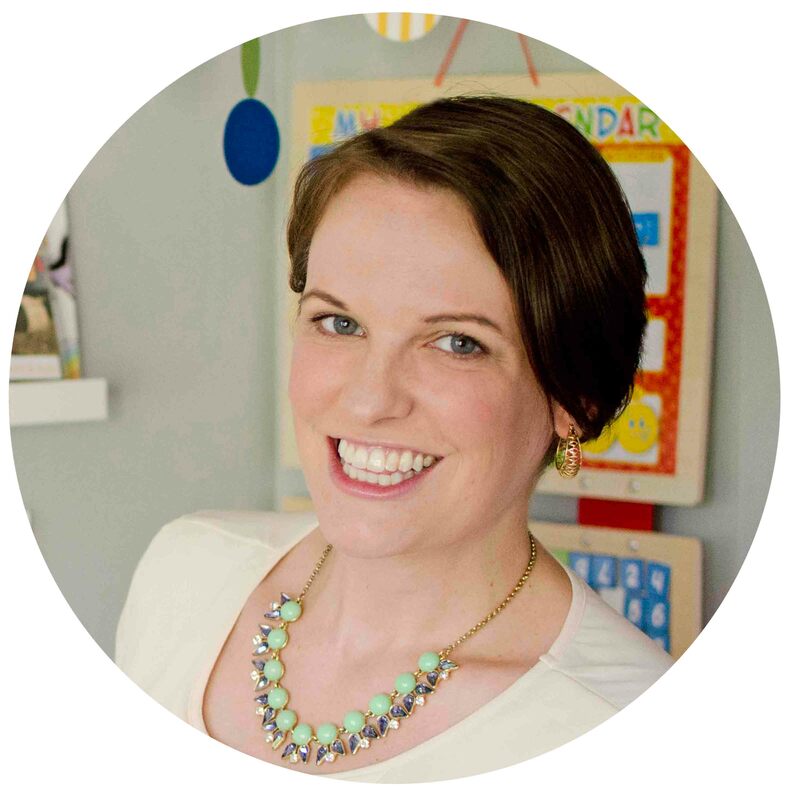 The products are well-made, teacher-designed, and kid-tested. But the best is – I know my kids are playing AND learning whenever they are using a Lakeshore toy. 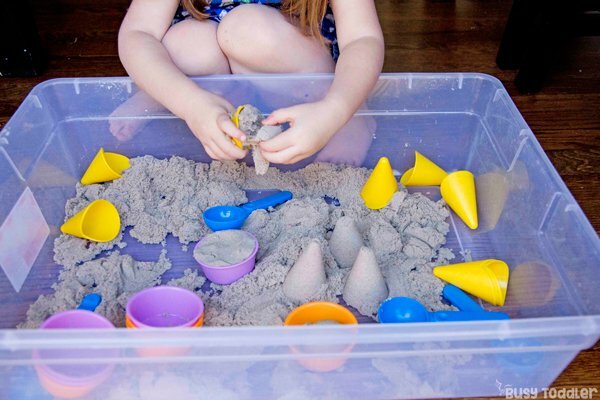 Looking to grab some kinetic sensory sand for your kids? 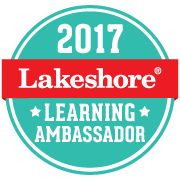 Use this 25% off coupon from Lakeshore Learning! To learn more about Lakeshore, find them on Facebook, Instagram, Twitter, Pinterest and YouTube.